Developed by Price Headley. These bands serve as a trading envelope using an instrument’s typical volatility over a standard setting of 20 bars. The upper and lower bands are plotted equidistant from a simple moving average (SMA) as a midpoint. 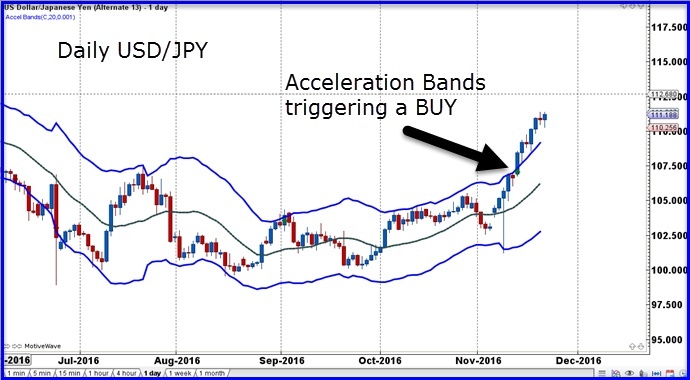 Acceleration bands are designed to catch strongly trending markets just as the trend is about to take off. Yes, there are false breakouts, but the key is to manage the positions within risk limits and maximize the size of the winners and minimize the size of the losers. Designed as a trading envelope, they can be used across multiple time frames, from tic charts to monthly charts. They can also be used to trade any market, although they were initially designed for trading stocks. 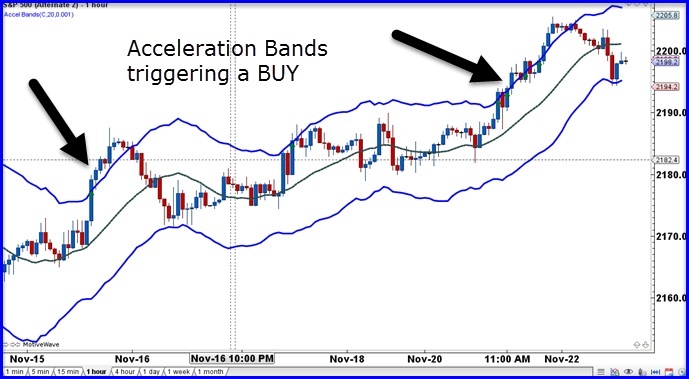 BUY Signal – two consecutive closes above the upper Acceleration Band (Try entering on one close above the upper Acceleration Band). EXIT Signal – one close back into the Acceleration Band (Try trailing a stop and initially use a stop below the 2 entry candles). As with any indicator/ system, it is important to observe the behavior of the Bands across many markets and time frames to get comfortable with the indicator personality. Once that is established, different trade management strategies can be implemented and a combination of indicators can be used for confirmation. The S&P hourly chart above shows 2 BUY trades once 2 candles close above the upper Acceleration Band. For the most part the S&P stayed within the bands during this time period but let’s examine the moves once the Bands were breached and the signal triggered. EXIT: 2182 on November 16th. EXIT: 2203 on November 22nd. While this was initially designed for stocks, it also works on currencies. The Daily USD/JPY chart below produced 1 signal on November 14th since July 2016. EXIT: Still in play on November 22nd with price at 111.16. With the USD/JPY still in play, if anything, this indicator helps traders not buck the trend. It shows the trends that are very strong and when scanned across multiple markets, it may do very well to sniff out those strongly trending markets. Beware of false breakouts but if stops are close, that will improve the results. See you next week for another “A” indicator! This entry was posted in Trading Tips and tagged Acceleration Bands, forex, market analysis, S&P, USD/JPY.